By popular demand, we will now be offering free art classes on Saturdays (beginning March 12th) from 11:00am-2:00pm. 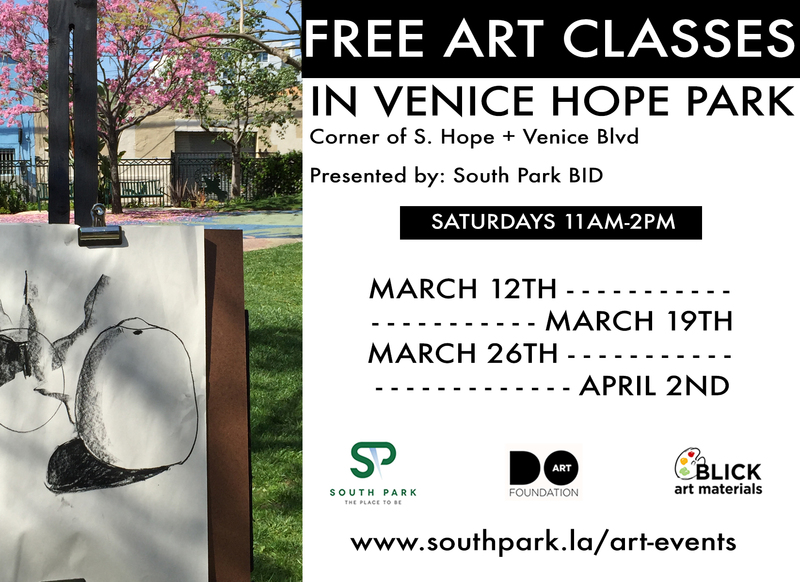 Join us for a series of free art classes, open to the public for all ages. This is part of the ongoing South Park Public Art Initiative & Strategic Plan giving the residents and stakeholders of DTLA what they are most interested in. Roll up your creative sleeves and DoArT with us! The art classes will teach illustrative and drawing skills using charcoal, paint, and other mediums. Individuals participate on a first come, first served basis, with priority given to children. Public art classes bring together the South Park community, encourage creative expression, and foster more community creativity. The programming activates the park and support positive community activities to take place in the local area. Classes will take place outside. Bring a hat, water, and sunscreen. In the case of rain, classes will be held at HNYPT (212 W. 12th Street).